There are a wide variety of roles that rely on Fastly in one way or another, ranging from hands-on developers to data-driven marketers. One thing that has become clear is that a growing number of you prefer to work largely from our control panel. As such, we’ve invested more into our UI, including a full redesign and replatform and several enhancements that add more functionality to our control panel. Our design process is largely driven by your input. We perform usability studies with you to get early feedback on our vision, incorporating the findings to maximize value and usability. The design process doesn’t stop at code release. For those of you who opt in, the Beta and Limited Availability phase is an opportunity for us to make further refinements after it’s been used in the wild. We’re fortunate to have such great customers that value their partnership with Fastly and are invested in helping further develop our offering. Our Web Application Firewall (WAF) protects your applications from malicious attacks designed to compromise web servers. It provides global protection without any significant performance impact because it’s fully integrated into our edge cloud platform, giving every cache node in our network the ability to scrub traffic against your WAF rules. When it came to designing the WAF dashboard, we worked closely with you to better understand your needs. We heard loud and clear that you wanted visibility into how your WAF was running, at both high and granular levels. Thanks to our early adopters, we were able to learn about how you manage the security of your systems. We then prototyped different options before deciding which combination of data and graph style to build. Below is a screenshot of the resulting WAF dashboard. The active rules are broken out by category: OWASP, application-specific, and Fastly-created rules. The active rule categories demonstrate that the WAF is actively protecting your origin. It also helps them understand what types of protections are active and which OWASP rules may have been initially disabled due to false positives during the tuning phase. 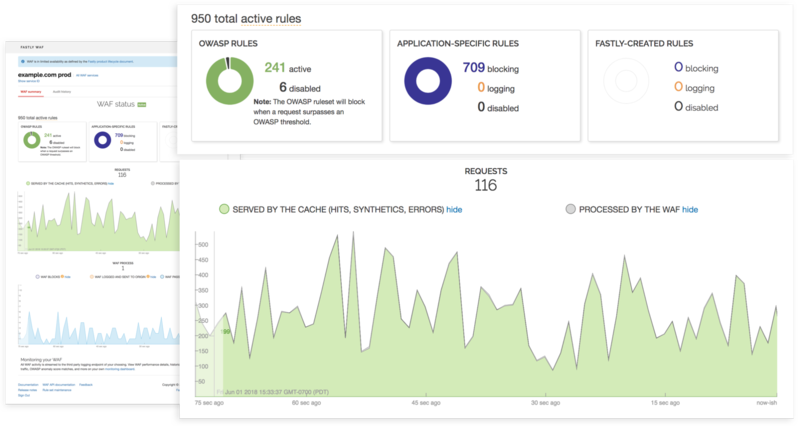 This “at a glance” view allows you to demonstrate your security and compliance posture very quickly without having to visually digest and understand hundreds or thousands of WAF rules. Two live graphs show how traffic is being handled by the cache and processed by the WAF. Our Image Optimizer is a real-time image manipulation and delivery service built on our edge cloud platform. It allows you to transform and serve images at the edge, eliminating offline image pre-processing tasks and drastically speed up delivery. Early adopters of our Image Optimizer told us they wanted more visibility into their image performance, both real-time and historical. We also added the ability to view and edit your default settings directly in the control panel. Below is a screenshot of our analytics dashboard that provides both real-time and historical stats. 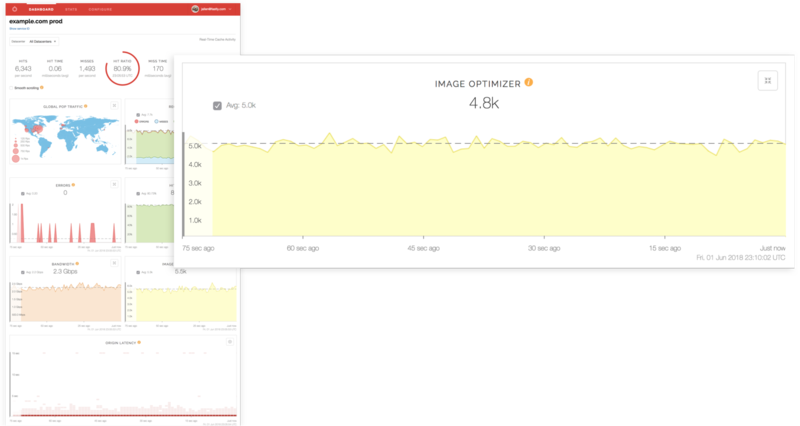 Your ability to see the number of requests processed by our Image Optimizer allows you to closely monitor the health of your image service. These insights can be particularly valuable during high-traffic events. If there’s an issue with image processing, you can quickly identify and fix it while continuing to serve content to your users. We’ve added and improved several user management capabilities, which have been especially helpful for those of you with large teams of varying roles. 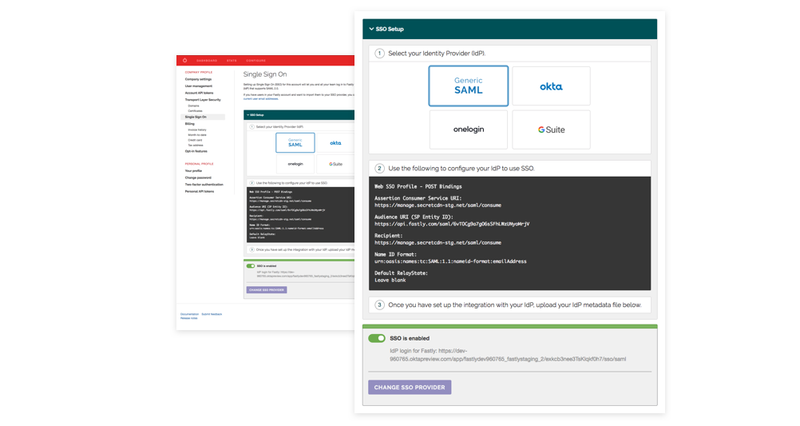 Single sign-on (SSO) provides a way to login to the Fastly Control Panel via a third party identity provider using SAML 2.0 rather than via an email address and password. Early in the design process, we recognized that many of you integrate dozens of solutions into SSO and could give very pointed feedback. We’ve also made it easier to manage user permissions using role-based access controls (RBAC). 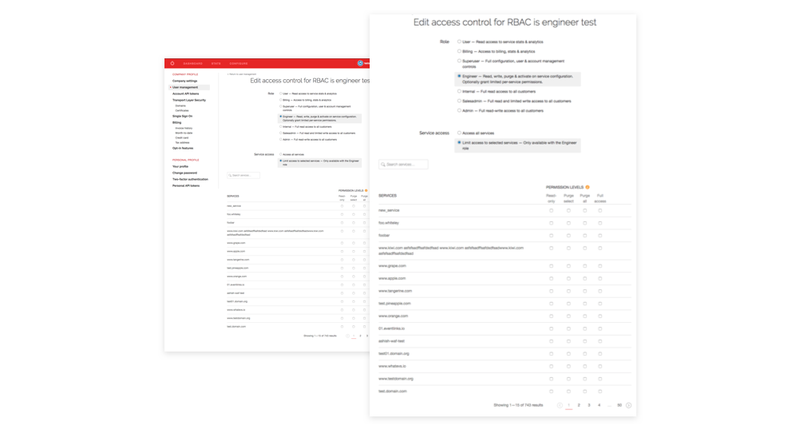 RBAC allows your teams to expand access for the management of Fastly configurations while ensuring that users only have access to the permissions they need. This level of control is particularly useful for large teams managing multiple services. Below are screenshots of both the SSO and RBAC interfaces. They’re easy to navigate and all changes take effect immediately. One early adopter at a large web hosting company was impressed with how seamless it was to provision their SSO provider, taking only 15 minutes from start to finish. Our mission to elevate the user experience is a continuous process. These UX updates are only a sampling of the recent enhancements we’ve made to our control panel. If you’re interested in Beta and/or Limited Availability testing of future products and services please let us know by sending an email to support@fastly.com. We’d love to hear from you.